It is still November as I write this and our Christmas cards are still unwritten! However, during the first weeks of December I know that Christmas cards will begin arriving on the door mat and the pressure to get ours posted will be on. Over the next few weeks those who live in the parishes of Prestbury, All Saints, Swindon Village and Cheltenham St Peter, and Elmstone Hardwicke with Uckington, will, we hope, receive one of our North Cheltenham Team Ministry Christmas cards. (Thank you to all the people who will have been out delivering them). These cards carry Christmas greetings on behalf of all of us who feel that we are members of one of the churches in the Team Ministry. They also carry details of the variety of Christmas services which will be taking place in the local church. These service details are given as an invitation because we very much hope and pray that many people from the local community will be able to join in with the Christmas celebrations in their local church and we look forward to welcoming them as we host a wide variety of Christmas services. This year, the front of the North Cheltenham Team Ministry Christmas card carries the words: ‘make space in your life to celebrate The Birth!’ A picture of a crib or manger is shown amongst sprigs and wreaths of holly and stockings full of presents. A good reminder to us all of the importance of making sure that we do leave room for the ‘real meaning of Christmas’ as we inevitably get caught up with all the other things: card writing, present buying, food shopping and so on! Looking again at the picture of the crib on the front of the Christmas card I realise how easily I can overlook the enormous significance of what we are celebrating at Christmastime. I get so used to seeing pictures of brightly lit nativity scenes with their clean straw, clean animals, smiling parents and perfect, sleeping baby, that I forget the reality of the world into which Jesus was born. I forget the tremendous difficulties which Mary and Joseph would have experienced as a couple because of Jesus’ birth. I forget the awful conditions in which Jesus really came into the world; nothing that we would ever see depicted on a traditional Christmas card. And yet the truth is, as we are told in St John’s gospel, ‘God so loved the world that he gave his only son’. We make such a fuss of celebrating Jesus’ birth because we are celebrating the truth of God’s love for each and every one of us, love which is shown to us in the person of Jesus Christ: God himself living as one of us, experiencing life, with all its joys and pains, and ultimately giving his life for us on the cross. When we begin to reflect on all of that, then we will understand something of why it is so important to make some space in our own lives to celebrate ‘The Birth’. The invitation which goes out in our Team Christmas card is sent with the genuine hope that all those who are able to join in some, or maybe only one, of the Christmas services will experience the true joy of the celebration of God’s unique and wonderful gift to the world; the gift of his son, our Lord Jesus Christ. May you know the rich blessing of the Christ-child in your life this Christmas. After a number of years in post, Lindsey McGowan will be stepping down at the end of this year from her role as co-ordinator of church flowers at St Mary’s. Lindsey has brought her considerable gifts for flower-arranging and floral art to this role and we are very grateful to her for the beautiful floral displays which she, and those who have worked with her, have produced over the recent years. These often quite stunning arrangements have been very much appreciated by those who worship regularly with us, as well as by our many visitors. As part of her role, Lindsey has also co-ordinated the flowers for weddings in St Mary’s, not only producing arrangements herself, but also handling the negotiations with the brides. Thank you Lindsey for sharing your gifts and talents with us; we hope to see some of your arrangements in St Mary’s or St Nicolas’ in the future! Many thanks to all my friends in the North Cheltenham Team Ministry for your good wishes and prayers as I have been recuperating from my recent knee operation. I am pleased to say that it seems to have been very successful and I am now on the road to full mobility and to be able to resume my usual fast pace. An interesting experience this time round though was my enforced use of a wheelchair as we visited Anna at University one week after my operation. Pushing a wheelchair around the cobbled streets of York posed challenges for Michael, Simon and Anna as they struggled to negotiate deep kerbs and narrow pavements. It was good to keep a sense of humour as I got stuck in a rut half way across a busy main road, much to the amusement of the passengers in the line of stationary vehicles patiently waiting for my ‘learner carers’ to get me to the other side. My most interesting observation though was the reaction of members of the public as I was wheeled around. It is human nature to be curious and I was not surprised to catch many passers-by ‘looking’ at me. Very few actually made full eye contact with me, preferring to attempt an indiscreet side-long stare. I found this extremely dehumanising and made me think again about how we interact with those around us. As a teacher, I use eye contact enormously as a tool for pupil engagement and classroom control, but do I always translate that to situations when I am with people whom I know less well? Could that vital eye contact, accompanied by an open, friendly smile, be a much more powerful gesture than we realise? So, as well as putting my new knee through its paces over the next few months, I shall be putting renewed eye contact to the test. You have been warned! Our thanks go to Dee Graham who has organised a super new replacement wheelchair for use by the congregation at St Mary’s. The cost involved in the provision of the wheelchair has been met by an anonymous donor, and Dee has passed on our appreciation and thanks to this person. The main focus of the November Cheltenham Deanery Synod meeting, held at Holy Apostles’ Church, was a presentation about Cheltenham’s newly built and opened All Saints’ Academy. The Principal, Peter Kingham, explained the Christian ethos underpinning everything that is done at the Anglican/Catholic independent state-funded secondary school for ages 11-19 years. Currently there are some 800 pupils and that will grow to more than 1000. Mr Kingham explained how Gospel values, including love, peace and reconciliation, are key to the strategies in management and both teaching and pastoral work. Prayer is integrated into the day, week, term and year for meetings, assemblies and individuals. Staff aim to go the extra mile for people. At the heart of the impressive building is a copper-coated chapel, jointly financed by the Church of England and the Roman Catholic Church. The Principal is passionate to recognize areas of faith that Anglicans and Catholics both hold while being realistic in recognizing differences too. An important verse to the Academy is the first verse of Psalm 133: ‘How wonderful it is, how pleasant, for God’s people to live together in harmony’. Any questions about All Saints’ Academy would be welcomed via Lindsey, the Principal’s PA, at LHoughton asachelt.org. Additionally Fr Michael gave a clear and upbeat account of how the North Cheltenham Team Ministry Vision for Swindon Village is taking shape as part of the North Mission Area of the Deanery. Fr Daniel outlined his role and responsibility as Deanery Advisor in the Healing Ministry. The next meeting is on 15th February 2012 at St Silas’. On Saturday 5th November a group of Mothers’ Union members went over to Gloucester Cathedral for the annual Diocesan Service. This is always a joyous occasion and this year had an African theme. The service began with the procession of Branch banners led by the Diocesan banner. Our banner was ably carried by Jenny. The service was conducted by the Dean of Gloucester, and Sue Wilson, the Action and Outreach Co-ordinator at Mary Sumner House, spoke of the work done by Action and Outreach workers overseas. A cheque for over £8,000 was presented to Sue; this was money collected from each deanery to aid the work of overseas community workers, who often have to travel for many miles to cover their province. The collection also went towards this fund, during which the choir Rough Diamonds sang two African songs, ‘Baba Yetu’ (part of the Lord’s Prayer in Swahili) and ‘Ise Olva’ (‘That which the creator has made cannot be destroyed’). Before the final hymn and blessing Liz Curtis led us in African-style flag-waving and dance. Altogether a memorable occasion. On 30th October the Local Ministry Team held a party in St Nicolas’ Church for some of the families of recently baptised children. The afternoon was good fun and everyone enjoyed themselves. We started with a short service which included some favourite songs from our Celebrate! service and the story of the baptism of Jesus, re-enacted by the Open The Book team with the assistance of some younger members of the congregation. This was followed by a shared welcome and presentation of baptism candles. We then moved across to St Nicolas’ Church Hall for party music, hand painting, craft activities, ‘Stick the Flame on the Candle’ game, party food for the children and chat over refreshing teas and coffees for the grown-ups. Thank you to Frances Murton, Jerry Porter and Margaret Compton for helping me with the preparation and organization, to Sharon Macauly, Brian Wood and Open The Book team for help with the service and to Hilary Brick, Margaret Moore, Paul Barnes, Stephen Murton, William and Cara for your help on the day! We hope to run further parties in the future; please contact if you would like to help. Leaflets are available in both churches and we will start using them at our services from 1st December. We hope that everyone who prays will join in this project. Please take a leaflet for use at home. If you would like a leaflet from the other church, ask a member of the LMT, who will obtain one for you. On Monday we vacated the cottage and moved further south for a three-night stay in chalets at Chilema Ecumenical Lay Training centre where amongst other things they run six-month courses for women to learn skills such as needlework, use of sewing machines etc. The old hand- or treadle-driven machines are very valuable as the women can earn an income from the manufacture and repair of clothes. On our way we visited St Martin’s Hospital at Malindi, which is on the eastern shore of the lake in a small area of Malawi occupying that side. Further north the lake belongs to Mozambique. Here MACS is negotiating for a new Guardian shelter. 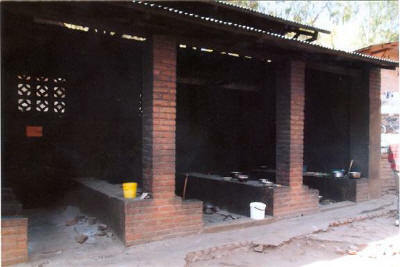 This is a living area for the family of patients in the hospital and consists of a covered cooking area and a separate sleeping shelter. The hospitals do not provide food for in-patients, only a roof and the treatment, so the family has to bring all the items for themselves and the patient. At St Martin’s Hospital the shelter is inadequate hence the negotiation. After inspecting another teacher’s house we were given the usual lunch of chicken and rice in a small restaurant on the lakeside. 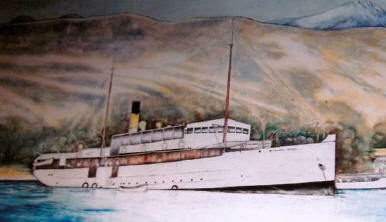 On the wall was a painting of the mission steamer Chauncy Maples which sailed the lake acting as a hospital ship, a mobile clinic and a ferry. It is now anchored in Monkey Bay with a restoration figure of over £1,000,000. It may be a worthwhile project from the historical point of view but that sum would provide an enormous quantity of relief to the country and cannot be justified when so much needs to be done for the general population. We settled in at the centre and the next morning walked up to see one of the recent projects, a rebuilt dam which would provide water for the Chilema centre, the local school, the diocese headquarters, and St Luke’s Hospital. 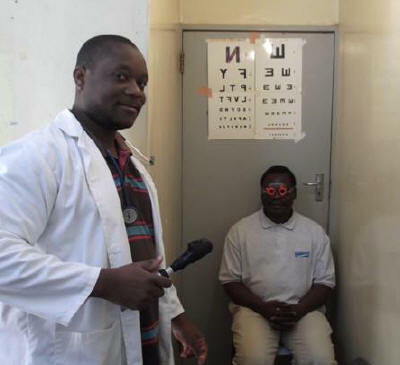 You have probably been wondering when I would get here as this is the hospital to which I have been sending medical equipment including your donated glasses. The doctor who originally requested various medical items had finished her three years in June so when I arrived nobody seemed to know the whereabouts of the items sent out from Birmingham last March. The assistant matron and I worked for the afternoon and managed to collect most of the items and fit them all together. I left the finer details of the ECG machine to a couple of Dutch medical students as they seemed to be the most reliable on the site. The medical staff were out in the villages doing clinics, I hope using my old GP case. The main project for the morning was to go out with the MACOBO volunteers who provide social help to the elderly, disabled and others in need. They are provided with bicycles on which they cover the villages in their region and it was fitting that we should travel by the same means. We were provided with Bicycle Taxis which are the main form of hired transport in the area. It is rather like sitting on a luggage carrier but with a cushioned seat and if you are lucky a pair of foot rests and the taxi driver does the hard work. A group of volunteers were repairing the porch of an elderly lady’s house by collecting the damaged soil and remixing it like cement and then relaying it by hand. We were invited to help. The other stop on our taxi trip was to see the mosquito nets supplied by MACS which have made life so much safer by reducing the risk of malaria. In the afternoon we visited Zomba, which was in colonial days the capital but after independence a new one was built in a more central position. Our intention was to shop but the town was shut down because of demonstrations against the government. The crowd turned nasty and we were prevented from returning to base until after dark when the police had managed to clear the road, which was still littered with debris from the riot. Our last day was one of relaxation in a safari park where we were taken on the usual trips before returning to the capital and our flight home. Firstly, a big thank-you to everyone who gave up their time on Saturday 12th November to help with the churchyard tidy-up at St Mary’s. It was a very pleasant Autumn day for carrying out the planned jobs including: raking and bagging up fallen leaves, clearing gulleys, removing ivy from tombstones, and trimming branches from conifers. Thanks also to Steve and Emma at Prestbury Village Stores for generously donating the much appreciated sausage rolls eagerly consumed mid-morning by the volunteer workforce. Following the fall of a large branch from one of the horse chestnut trees in the churchyard a tree surgeon was consulted and, following his advice, a number of the trees in the churchyard will be undergoing some much needed maintenance at the beginning of December. Finally, you may have noticed the work carried out on a number of the churchyard monuments. This work has now been suspended, due to the potential for bad weather, until spring time next year when the stone mason will return to complete restoration work on four more of the grade II listed monuments. On Friday 14th and Saturday 15th October CHADS put on their annual performance at Prestbury Hall. The show, entitled ‘Visual Variety’, was extremely well supported on both evenings and an enjoyable time was had by all. After each performance there were refreshments for everyone, plus a raffle and an auction. CHADS always donate their proceeds to a worthy charity and this year the charity to benefit is ‘STEPS’ – a small national charity supporting children and adults affected by a lower limb condition such as hip dysplasia or club foot. This charity was chosen because, as many people are aware, my grand-daughter, Demi, was born with severe hip dysplasia for which she has been receiving treatment throughout the last year, and will be for some time to come. Also her two older cousins, Matthew and Sophie Bestwick, have both played a significant part in the CHADS production. Just recently another little girl in our Church Family (Erin, Linda Biggs’ grand-daughter) has also been diagnosed with the same condition and her Mum, like Demi’s Mum, has been helped by the STEPS charity. 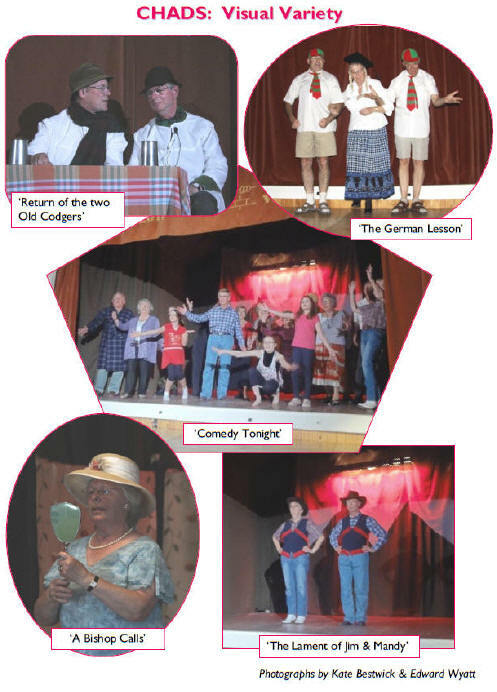 The overall proceeds from the performances total £1,600 and, because a sponsor has covered all the production and running costs, this is all profit. Of this, £1,300 has been given to STEPS and £300 to the Prestbury Hall. Our heartfelt thanks go to everyone who has worked so hard to put on this production and also to all those people who came and supported them. And a special thank you from Demi. Since I announced in July that I would be standing down as editor there have been several discussions about the future, not only of the magazine, but of publication in general across the two churches of this parish and the five churches of the North Cheltenham Team Ministry. 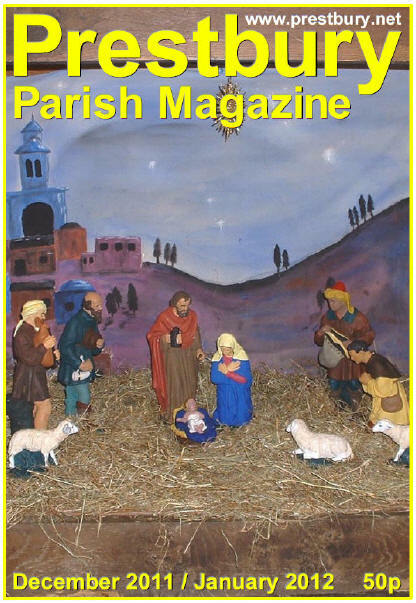 Only two of the four parishes have a church-based magazine. St Peter’s used to, but it ceased publishing when the parish joined with Swindon Village. There is, of course a magazine in Swindon, but it is a village publication rather than a church one. As I have said before, there are many jobs involved in editing and compiling a magazine such as this one. We are pleased to have had offers of help with various different roles: IT skills, English language skills, proof-reading, photography and photo-editing. We hope to co-ordinate an editorial team early next year, so that the magazine will continue to be published in similar format to this, and with similar frequency. Of course the editors will rely on you to continue providing both written and pictorial material on a regular basis. Those of you who supply advance information such as dates of events, please remember that the deadlines are earlier than you think! Those of you who write reports or express opinions after events, please try to keep your articles short. Most people I speak to like the magazine as it is. So let’s keep it as it is, but also let us not be afraid to allow it to continue to grow, change and develop as it has done for the last one hundred and twenty-seven years. No, don’t be silly: I haven’t been editor that long! If you would like to become part of the team, perhaps as a backup in case any of the others is unavailable one particular month, please let us know. The easiest way is to email . Would you miss all this? Is God nudging you to help? There was a prophet, Anna the daughter of Phanuel, of the tribe of Asher. She was of a great age, having lived with her husband seven years after her marriage, then as a widow to the age of eighty-four. She never left the temple but worshipped there with fasting and prayer night and day. At that moment she came, and began to praise God and to speak about the child to all who were looking for the redemption of Jerusalem. In today’s world Luke could have made a name for himself as a class journalist, for as well as drawing on other sources he followed up exclusives of his own, and this passage, along with much else in the first chapters of his Gospel, is a memorable example. It is typical of Luke too not just to write about the famous figures, but also to highlight the part played by people – and distinctively by women, so marginalised then – hovering around the edge of the big story. It is usually Simeon who is centre-stage here, and to get the context we have to read verses 22-35. But now let us focus on Anna, who belongs in this extraordinary moment too. Interestingly, we learn more about her than about Simeon, for with that journalistic eye for detail Luke has found out not only her name but who her father was and the clan her family belonged to – the three names that told exactly who you were. Writing two generations later, from the standpoint of a cultured Gentile, Luke gives Anna a significance she would not have had in her own day. She would have been young when her husband died – girls married usually around fourteen – and, left on her own, it seems she found the temple a safe place where she could spend the rest of her lonely life reflecting and praying. She would not be allowed beyond the outer Court of Women, but there she somehow fitted in. So this became her life, comfortable but uneventful, as the years passed, until one day a couple appeared, bringing their new child for the infant blessing ceremony, and in a flash of insight Anna saw in this ordinary child of ordinary parents what for generations all Israel had been waiting for– the long promised Messiah, sent from God. It is a story of a vivid, world-changing moment, yet it is also in a way a story about old age, and the gifts old people bring to the sweep of history. Anna represents those of her time who, as they thought about Israel’s history, saw in it not just struggle and failure, but promise and hope. Anna, and Simeon, and others like them were people both of memory and of expectancy. What are old people for? Apt to be defined by what they used to be, but no longer can be, where do they fit in? Here is a text that tells us that older people, then and now, have a unique role to fulfil, in family, society and church, and in that mysterious breaking story the New Testament calls ‘the kingdom’. In the critical, unsteady time we are living through, the world and the church need Annas and Simeons, old women and men who have learned how to wait, to be patient, and sometimes to take things slowly (‘prayer and fasting’, you could say), but whose reading of the past tells them that there is much more still to come. Because we are custodians of a great memory we become bearers of a great hope, for we have discovered that the God we see in the past is, and always has been, supremely the God of surprises. The ‘Real Christmas’ this year will be on Saturday 3rd December in St Mary’s Church from 2pm until 5pm. There will be seasonal stalls, entertainment and refreshments. Entry is free and all are invited to come and spend some time with us. St Nicolas’ day is actually 6th December, but we will celebrate the patronal festival at St Nicolas’ on Sunday 4th December at 9.30am when the guest preacher will be Fr Grant Bayliss, a former curate. We look forward to welcoming Fr Grant and the family on that weekend. The Christingle Service carries a deep message of God’s love and is a particularly special way for us all to reach out together to help children and young people who are in urgent need. During the service Christingle oranges will be given to everyone who brings a gift of money for the work of The Children’s Society; this will help them to continue to take direct action to support disadvantaged children all over the UK. If you would like a collecting box, please ask one of the churchwardens. Our December meeting will be on Tuesday 6th December at the earlier time of 7pm, when we will have Christmas music led by Frances Pavey and readings by some of our young family members. 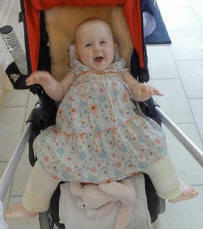 We will have seasonal refreshments and an evening with a difference, when we hope Demi and family will be with us. Everyone is very welcome, especially young people and family members. Our first meeting next year is on Tuesday 24th January at 7.30pm and our guest speaker will be the Reverend Rod Paterson, whose topic is entitled ‘India’. He is an inspiring speaker and everyone is welcome to come and meet him. Both meetings are at St Nicolas’ church. At St Nicolas’ Church on Tuesday 20th December at 7.00-8.00pm there will be an informal programme of Christmas songs, carols and readings. Seasonal refreshments will be served. Everyone welcome. This scheme will be available again at St Mary’s during December this year. Instead of sending individual cards to all your church friends just bring one card with your greetings to display in church and make a donation (which may be gift-aided) to World Vision for the relief of existing widespread poverty and starvation. Once again the Holy Family figures will journey around the parish during Advent, visiting different homes. If you would like them to visit you for a couple of days, please speak to Sylvia McKenzie at St Mary’s or Jeanette Behenna at St Nicolas’. Would you like to sing your favourite Christmas carols with a friendly group of singers? Why not join St Mary’s Choir for the Christmas season? Choir practice is from 7pm to 8pm on Friday evenings, usually followed by a well-earned visit to the pub. The ability to read music is not absolutely necessary; more important is a willingness to give it a go and enjoy singing! If this sounds appealing, please contact the , David Smith. Please note that there will be no other services on Sunday 1st January. The Epiphany Party is to be held on the Feast of the Epiphany, Friday 6th January, following the Sung Eucharist at 6.30pm. A hot meal will be served. Tickets will be priced at £7.50 and will be available just before Christmas from churchwardens and from Lynda Hodges (at the 8.00am service on Sundays). Our November bakestall raised £46 for Children in Distress, making the splendid total of £570 sent to our various charities this year. This is the best ever! Thank you to everyone who has baked and bought to make this possible. We have no bakestall in December, but on Sunday 15th January next year all three teams are invited to contribute to get us off to a good start once more. 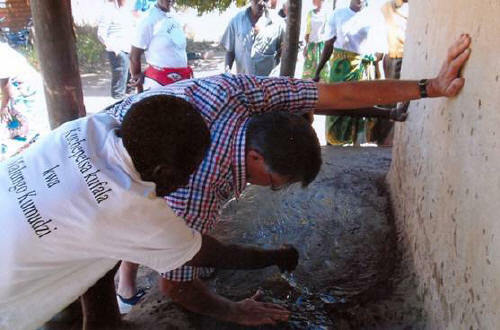 To follow on from my summer visit to Malawi I have arranged for the charity’s chairman Richard Barton to come and explain more fully the work of MACS and life in one of the poorest countries in Africa. This will be in St Mary’s Church at 7.30pm on Thursday 19th January 2012. Light refreshments will be served after the talk. Watch out for more details nearer the time but book the date now in your 2012 diaries. For those who are not familiar with the customs north of the border, it is a tradition to celebrate the birth of their greatest poet on 25th January, which in 2012 falls on a Wednesday. However, thanks to the help of Sarah Jones of Elmstone Hardwicke we have managed to secure the use of the village hall at Uckington for the evening of Saturday 21st January from 7.30pm where we will be able to celebrate Robbie Burns’ birthday in style. This is a North Cheltenham Team Event. Accommodation is limited to 70 persons, who will be served the traditional supper and entertained by The Gloucestershire Scottish Dance Demonstration Team and then pressed into taking the floor themselves until the late hour of 11.00pm. Kilts and Tartan (if you have them). Bar available. A place may be reserved at this celebration by the donation of £10 to Roger Hodges (St Mary’s), Gill Wood (St Nicolas’), Karen Evans (Swindon Village) or Sarah Jones (Uckington and Elmstone Hardwicke). All proceeds will go to the Christian Aid Zimbabwe Appeal. There will be a day school for flower arrangers at St Nicolas’ hall on Saturday 17th March 2012 led by Beryl Griffiths, a well-known demonstrator. We will start at 10am with coffee, and lunch will be provided. We are to bring our own flowers and foliage, details of which will be available nearer the time. The cost will be £10 per person, part of which will go to church funds. Numbers are limited, so if you are interested please contact Sue Fairclough to book a place. Once again All Saints’ cubs and scouts have provided some of the decorations for the church this Christmas. When taking down your cards in January, please could you keep to one side those with ‘Nativity’ scenes for us to re-use next year? There will be a box in St Nicolas’ or they can be passed to Miriam Barnes at St Mary’s or Tim Winder at All Saints’. Thank you. Matt and Martin ride again! The annual Ride and Stride run by Gloucestershire Historic Churches Trust took place on Saturday 10th September. Matt Bestwick, a server at St Mary’s, and Martin Wood, a member of the Celebrate! band, wheeled out their bikes and cycled around twenty-two churches in the diocese. Thanks to their efforts and the generosity of his many sponsors Matt has raised the huge sum of £500. 50% of this money is returned to support St Mary’s and the remaining 50% is used to support other historic churches in the Gloucester Diocese. Congratulations and many thanks to Matt and Martin for such a fantastic effort.